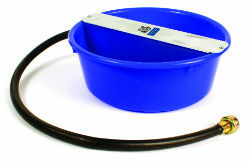 Provides a continuous flow of the freshest water for your pet. Attach the ¾” hose to your garden hose, turn on the tap, and the bowl fills to the perfect drinking level. The automatic float controls the water levels so there is no spilling or overflow. Bowl is automatically replenished every time your dog drinks.